HW 08:45, wind SW F3 12kts and building according to the Met office, however Windguru predicted F4 with very strong gusts. Light rain was also on the menu and with a temperature of between 22 and 23 deg C it was looking good. 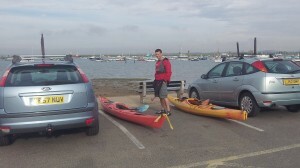 Gary and I arranged to meet at West Mersea Yacht club car park for 07:30. I was running late so was pushing the back roads a little only to see in my rear view mirror another late running kayaker catching up with me. A quick stop at the local dofors was called for to top up on sandwiches and choccy bars before unloading the kayaks from our cars ready for the off with time to spare. After some careful thought a decision was made to go clockwise around the island in order to ensure we had enough water to get over the Strood. A curlew having breakfast on the mud bank gave us a knowing wink that we had made the right choice. We were off. Winding our way through the fleet of moored up yachts we soon found ourselves in the tranquil back waters of Mersea, only to have it spoiled by a couple of speed boats messing around near to the Strood. 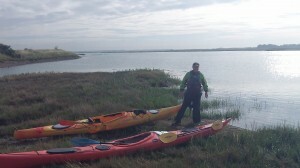 The wind and tide helped us make very good progress and we arrived at the Strood 15 minutes before high tide. We were met by a nice sandy beach on which to land on and with a quick portage we were soon on the eastern leg of our journey through Pyefleet creek and back into the quiet sanctuary of the river. After a short while our wilderness feeling was interrupted; we were being buzzed by a para glider who, wobbling like a crazy man, was only a few feet off the deck. He was struggling to stay up hunting desperately for a thermal or something. All I know is, he came pretty close to face planting in the mud! You felt like cheering when he eventually got to grips with his flying machine and started to climb back into the clouds. You could almost hear his relief. A little further on and we spotted a seal snorkelling in the distance. Lovely, you may think, however this seal was a serial stalker and began porpoising behind Garys kayak getting close, really close. Everytime I went for my camera, it disappeared under the water. It eventually gave up on Gary and picked on me. I could hear it snorting behind me and could feel myself gradually paddling faster and faster. I was getting a running commentary from Gary as to how close it was getting. Very disturbing. It was a big buggar too, with eyes the size of saucers, huge whiskers and white flashing teeth! You get the picture. 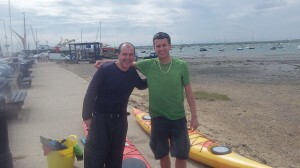 On reaching the the eastern side of the island we decided to take a break at Mersea Stone. This is where the foot ferry alights and is the half way mark. After a short break we were off again. We headed off again west on the south shore and into the main estuary. The waves were bigger and the wind was starting to show its self to us for the first time but in all honesty it wasn’t that bad and we made good headway passing Coopers beach in no time at all. Passing Coopers beach. From here the waves got a bit bigger and the wind picked up. 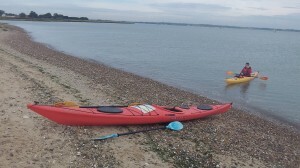 We stopped once more on a sand bank on the Mersea flats just short of Kings Hard before making the final push home. 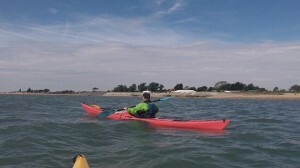 The wind had increased and so had the waves and it made the going a little more difficult especially as we were negotiating some very shallow stretches of water, although paddling through the sand banks was good fun. The kite surfers were out in force as were a couple of windsurfers, always a good sight to see. It was a bit of a slog to the sheltered inlet on the west side of the island, tiredness was starting to creep in and my hand was hurting from a previous kayaking accident. Before long, we were paddling through the moorings back to our get out point. The tide had drained out a long way and so beaching and recovery of the kayaks was a little on the muddy side especially as Gary decided to take a short cut rather than follow the trailer tracks in the mud. Really good paddle and well worth the early start. We took 4 hours and 15 minutes including a 45 minute break to circumnavigate the island. End of the line. Back where we started. .Thanks Gary for joining me.